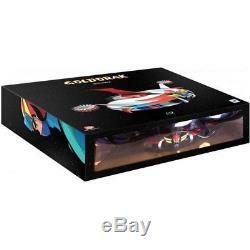 Blu-ray - goldorak - full - limited collector's edition. The warring empire vega invests the planet euphor and, in the final battle, actarus flees to planet earth aboard goldorak, the most sophisticated robot. It is collected by Professor Procyon, Director of the Space Research Center. To carry out its new objective the conquest of the earth vega installs a base on the hidden face of the moon. His men soon discover that the Prince of Euphoria has taken refuge on earth! Made in the mid-1970s and despite a limited animation and a repetitive scenario, this series keeps a certain charm. His characters, particularly charismatic, bring much to the dramaturgy of history. Finally, remember that goldorak was the first Japanese series to obtain a huge success on television in France. Older people will necessarily keep a special memory, especially since the anime has remained blocked (and therefore missing screens) for more than 15 years. Dimensions of the goldorak saucer: body thickness: 5 cm. Height with dorsal fin: 8 cm. Width of the body: 19 cm. Width with side wings: 33 cm. Dimensions of the box: 11cm x 37.5cm x 28cm (HxWxD). Weight of the saucer with 9 br: 450 g. Product already available on anime-store. Synopsis the warring empire vega invests the euphor planet and, in the final battle, actarus flees to planet earth aboard goldorak, the most sophisticated robot. To carry out its new goal - the conquest of the earth - vega installs a base on the far side of the moon. His men soon discover that the Prince of Euphoria has taken refuge on earth. Directors: gô nagai, tomoharu katsumata, tôei animationformat: color, full screen, monoaudio: japanese (pcm mono), french (pcm mono) subtitles: frenchregion: region b / 2 more information on dvd / blu ray. Number of discs: 9studio: ab videodate of the DVD release: October 4th 2017duration: 1727 minutes. Synopsis warring empire vega invests the planet euphor and, in the final battle, actarus flees to planet earth aboard goldorak, the most sophisticated robot. His men soon discover that the Prince of Euphoria has taken refuge on earth. Directors: gô nagai, tomoharu katsumata, tôei animation format: color, full screen, mono audio: japanese (pcm mono), french (pcm mono) subtitles: french region: region b / 2 more information on dvd formats / blu-ray. Number of discs: 9 studio: ab video release date of the DVD: October 4th, 2017 duration: 1727 minutes. We do not deliver post boxes or military bases, thank you to take into account when ordering. Followed letter - 0.00. Post - international economic mail - 7.90. For more information on delivery, click on more info. Sorry, our products are not available for withdrawal in store. On request, we offer the possibility to pay by bank transfer. No checks will be accepted. The law n 81-766 of August 10, 1981 relative to the price of the book, known as law lang (of the name of jack lang, minister of the culture), is a law establishing a unique price of the book in France. Ask the seller a question. Manga - academy alice (the) vol. Manga - princess sakura vol. Manga - nijika, dream actress, tome 3. Manga - nijika, dream actress, tome 5. To contact the customer service, simply click on the button and we will be happy to assist you. Delivery is free for this item (metropolitan France only). Upon request, we accept payment by transfer. The books will not be taken back if they present traces of folds, horny pages, writings .. the item "blu-ray goldorak integral edition collector limited" is on sale since Tuesday, June 19, 2018. It is in the category " dvd, cinema \ dvd, blu-ray ".